We are a married couple based in Locks Heath (near Southampton). Both of us are Professional Musicians and Teachers. As well as being accomplished performers, we are expert Entertainment Consultants providing Quality Live Music for Corporate and Private Functions and Charity Events. We provide Classical, Jazz, Rock, Folk and Pop Groups for Live Entertainment and Dancing. 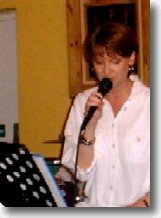 WENDY AUSTEN is well-known Singer/songwriter on the British music scene appearing at Ronnie Scott's Club with her own band THE TVRS and touring the UK and Europe. NICK BLUNN is a Jazz Pianist, Teacher and an Examiner for the Associated Board of the Royal Schools of Music. A full time professional, he is a member of eight bands,including THE TVRS, THE KING SWINGERS, JAX CATZ and the C.B.S.O. Ellingtonia Septet.